Please click on the image above to be taken to the application information page!!! You may apply for this scholarship from January 1, 2019- March 15, 2019! Click on this image to be taken to the Miss Montana website. Check out this website for more scholarships! Mid-Rivers will be awarding several scholarships in different categories. Applicants may apply for as many as they wish, but each student is eligible for only one (1) award. 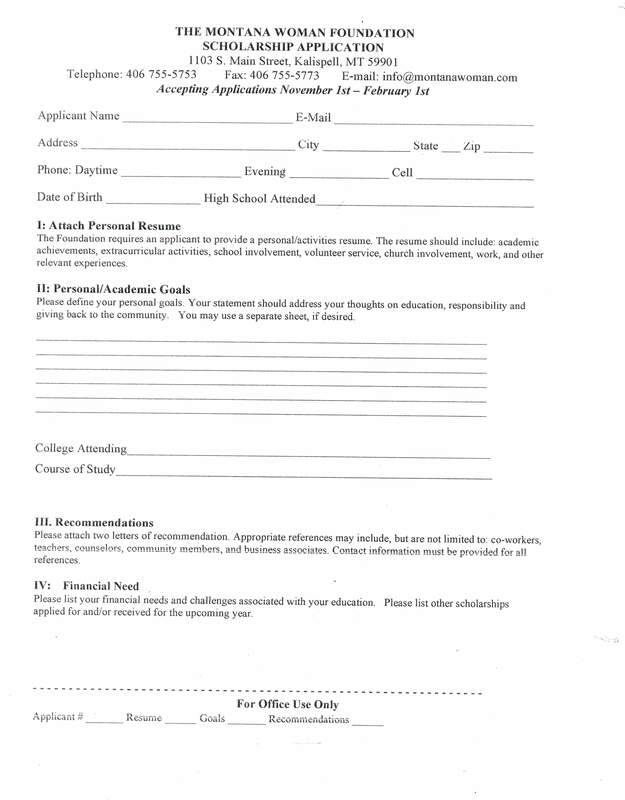 Graduating high school seniors entering his or her freshman year at a college, university or technical school Current college, university or technical school students planning to return to college in the fall of 2019 Scholarships in this category will be awarded based on the following criteria: Demonstration of specific plans and an authentic desire to return to the Mid-Rivers Service Area in the future. Plans to enter a field of study related to the Mid-Rivers mission (communications, IT technology, IP, etc.) Work experience and school and community activities during high school and/or college. Unique, inspiring and innovative Personal Statement. Grade point average and ACT/SAT test scores. Ability to communicate. Scholarships will be awarded in this category based on the following criteria: Demonstration of specific plans and an authentic desire to return to the Mid-Rivers Service Area in the future. Plans to enter a field of study related to the Mid-Rivers mission (communications, IT technology, IP, etc.) Work experience and school and community activities during high school and/or college. Unique, inspiring and innovative Personal Statement. Grade point average and ACT/SAT test scores. Ability to communicate. Graduating high school seniors entering his or her freshman year at a college, university, community college or technical school Current college, university, community college or technical school student Applicant must have plans to enter a field of study related to the Mid-Rivers Mission, with a desire to train for a possible long-term career opportunity at the Cooperative in any relevant field of interest (such as Accounting, Customer Service, Information Technology, Marketing, Technician, Technical Support). Finalists will be required to submit a video and interview with Mid-Rivers as part of the application process. Recipient will be required to maintain a minimum GPA of 3.0. Recipient will be required to complete an internship with Mid-Rivers Communications in his/her desired field of study. Internship duties and location will be determined in consultation with the winning applicant. Plans to enter a field of study related to the Mid-Rivers mission (communications, IT technology, IP, etc.) Demonstration of specific plans and an authentic desire to return to the Mid-Rivers Service Area in the future. Work experience and school and community activities during high school and/or college. Unique, inspiring and innovative Personal Statement. Grade point average and ACT/SAT test scores. Video submission (required for notified finalists only). Ability to communicate. Graduating high school seniors (diploma or GED) Current college, university, community college or technical school students Plans to enter a field of study related to the Mid-Rivers Mission. Finalists will be required to interview as part of the application process. To help prepare the recipient for success in the certification program, recipient will be required to complete a summer internship with Mid-Rivers before receiving payment. Demonstration of specific plans and an authentic desire to return to the Mid-Rivers Service Area in the future. Plans to enter a field of study related to the Mid-Rivers Mission (communications, IT technology, IP, etc.) Work experience and school and community activities during high school and/or college. Unique, inspiring and innovative Personal Statement. Grade point average and ACT/SAT test scores. Ability to communicate. Mid-Rivers Annual Meeting Drawing – Twelve (12) $500 scholarships will be awarded through a drawing of eligible students in attendance at the 2019 Mid-Rivers Annual Meeting on May 30, 2019, in Circle, MT. 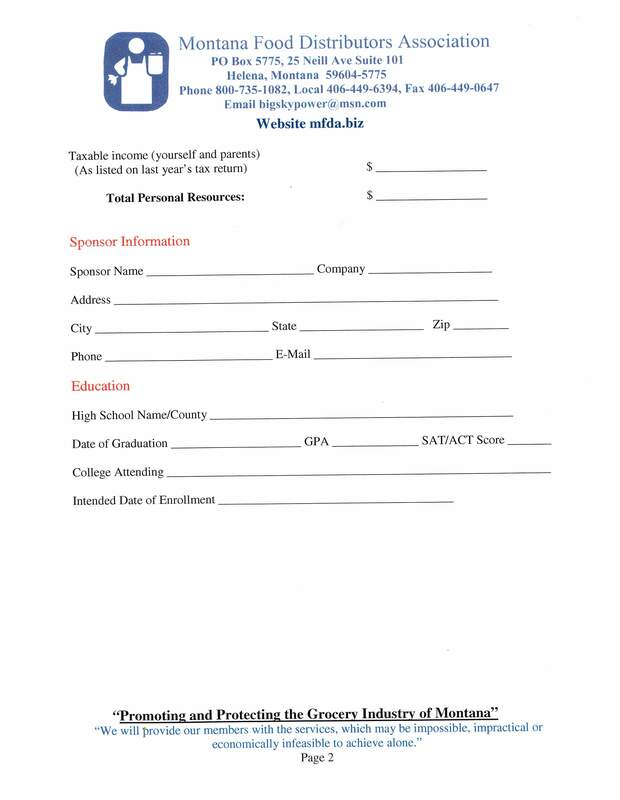 To qualify for the drawing, the student must attend the meeting with a parent or guardian who is a member of the Cooperative, register with the Scholarship table, provide proof of full-time enrollment, and participate in simple interactive tasks that will be assigned at the Annual Meeting. Registration for the meeting begins at 10AM at Circle High School and the meeting begins at 11AM. Students must be present at the time of the drawing to win. Click Here to Apply for any of the above scholarships! The Montana Coroners' Association announces the availability of a $500.00 scholarship to be awarded for the fall semester of the year 2019 to a graduating High School senior majoring in a Criminal Justice or Health Science field. Recipients will be selected on the basis of need and academic ability as well as career goals. 3) Enrollment as a full time student in a Montana based college or university that offers a minimum AA degree in Criminal Justice or Health Science field. 4) Submit of proof of enrollment intentions in a college or university based Criminal Justice or Health Science degree program. 1) Letter requesting consideration as an applicant. 2) Current High School Transcript. 3) Personal resume including references. 4) Outline of career goals. 5) Statement of current college education financing. The scholarship award winner check for $500.00 will be issued in the applicant's name and forwarded to the college or university where enrolled. The deadline is May 1, 2019. ​ Do you have a compelling recovery story? Have you witnessed the challenges that addiction can present, or helped someone overcome substance use disorder? Share your experience and describe why you are eager to enter the health care field for a chance to be awarded a $1,000 scholarship. Click here for more information and to access the application! 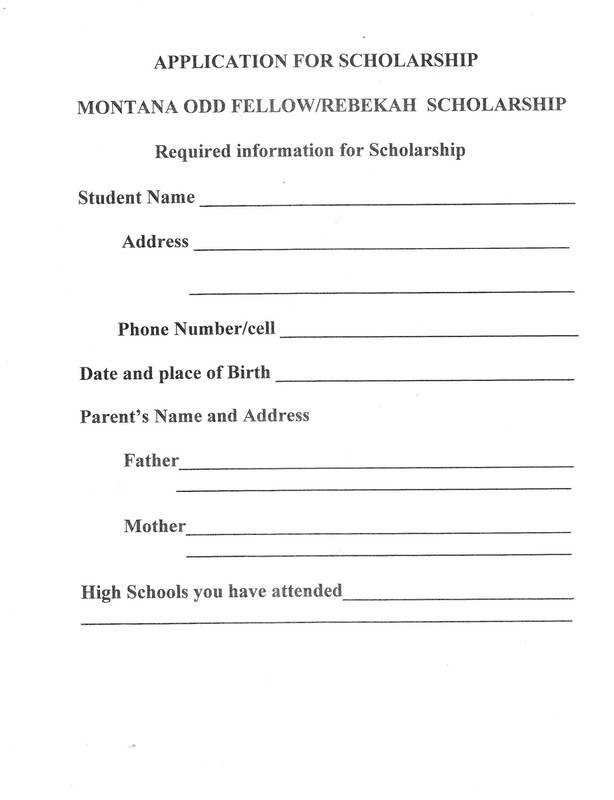 ONE OR MORE SCHOLARSHIPS WILL BE AWARDED TO A GRADUATING HIGH SCHOOL SENIOR WHO HAS (OR HAD) A MOTHER, FATHER, GRANDMOTHER, OR GRANDFATHER IN GOOD STANDING IN THE AUXILIARY TO VFW POST 4099, SIDNEY, MONTANA. IF THE RELATED PERSON IS DECEASED, THEY MUST HAVE BEEN A MEMBER IN GOOD STANDING IN THE AUXILIARY AT THE TIME OF THE DEATH. THE SCHOLARSHIP WILL BE DIVIDED SO THAT ONLY HALF WILL BE RECEIVED THE FIRST YEAR. UPON COMPLETION AND ENROLLMENT IN THE SECOND YEAR, THE SECOND HALF WILL BE RECEIVED. APPLICATIONS WILL BE DISQUALIFIED IF MORE INFORMATION IS RECEIVED THAN REQUESTED. THE APPLICATION MUST CONTAIN ONLY THE FOLLOWING INFORMATION. 2. NAME OF AUXILIARY MEMBER WHO MAKES YOU ELIGIBLE, AND YOUR RELATIONSHIP TO THE MEMBER. 3. NAME OF HIGH SCHOOL. 4. AN ESSAY OF 175-200 WORDS OF LESS STATING YOUR GOALS FOR THE FUTURE. PLEASE INCLUDE YOUR RESPONSIBILITIES, YOUR FINANCIAL NEED, ANY UNUSUAL CIRCUMSTANCES, AND YOUR PERSONAL EFFORTS TO HELP YOURSELF. 5. TWO LETTERS OF ENDORSEMENT FROM NON-SCHOOL ADULTS. 6. A SCHOOL TRANSCRIPT WITH SAT/ACT SCORES AND CLASS RANK BLACKENED OUT. 7. APPLICATIONS SHOULD BE POSTMARKED BY APRIL 30th. 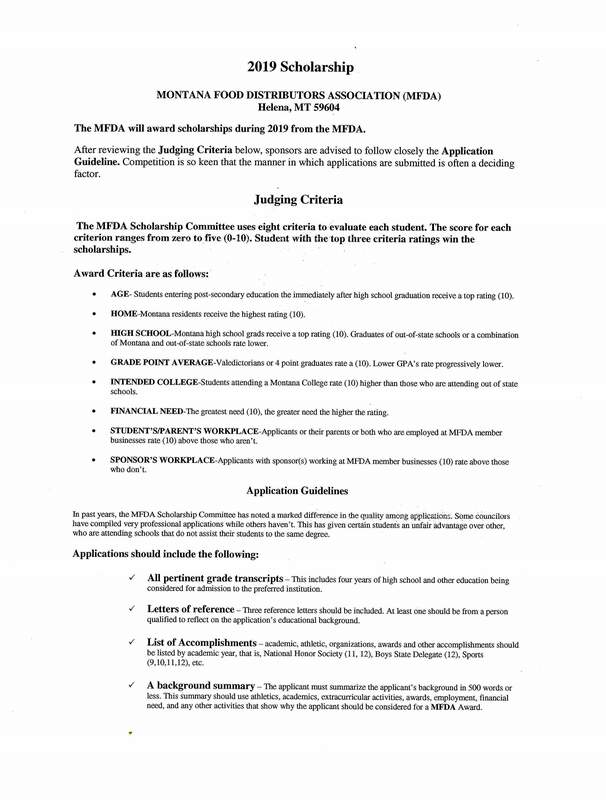 Scholarships are awarded to eligible students in Montana. The program specifically assists high school students who have face and overcome great obstacles in their young lives. The scholarships are funded by Horatio Alger and the Dennis and Phyllis Washington Foundation. Dennis Washington is a Horatio Alger member who, like the scholars, experienced challenges but ultimately overcame them to become a successful business and civic leader. ~Be a United States citizen *applicants for the Montana state scholarships must meet additional eligibility criteria. Available to both high school graduates and current college students who are seeking post-high school education including trade school, cosmetology, Bible College, etc. The Northeast Montana Thresher’s Association Scholarship is available to you if you are a high school senior, or are currently attending post high school education, and graduated from one of these counties: Williams County, North Dakota, Daniels, Sheridan, Roosevelt, Richland & McCone in Montana. The Northeast Montana Thresher’s Association will offer total scholarship awards of approximately $30,000 each year to deserving youth who have exemplified community service in these Northeastern Montana/North Dakota communities and demonstrate a desire to return to Montana or North Dakota upon completion of education. ​The Northeast Montana Thresher’s Association was founded in 1963 to preserve and demonstrate farm machinery and items used by yesterday's generations. The Association carried out its mission for over 50 years until disbanding in 2017. At this time members wanted to use the funds raised to establish a permanent scholarship endowment to benefit youth in Northeastern Montana (and Williams County, North Dakota). The intent of the scholarships is to reward those youth exemplifying citizenship and community service in their home communities, many of whom may return to their local communities and aid in keeping those communities alive and vibrant. Click here to download the information page and application! 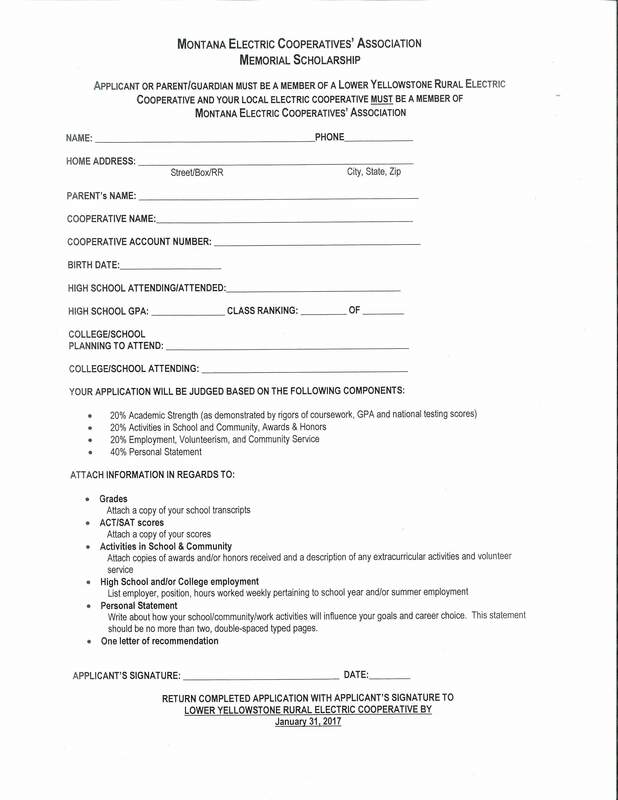 Agri Industries/Sax Electric from both Williston and Montana are trying to develop new electricians. They would like to offer a sponsorship to attend Wahpeton to a high school senior. l believe that then the successful candidate who completes the program would then be able to work at Sax Electric. Download this document for a collection of scholarships related to healthcare. Check each website for exact due dates and scholarship requirements. 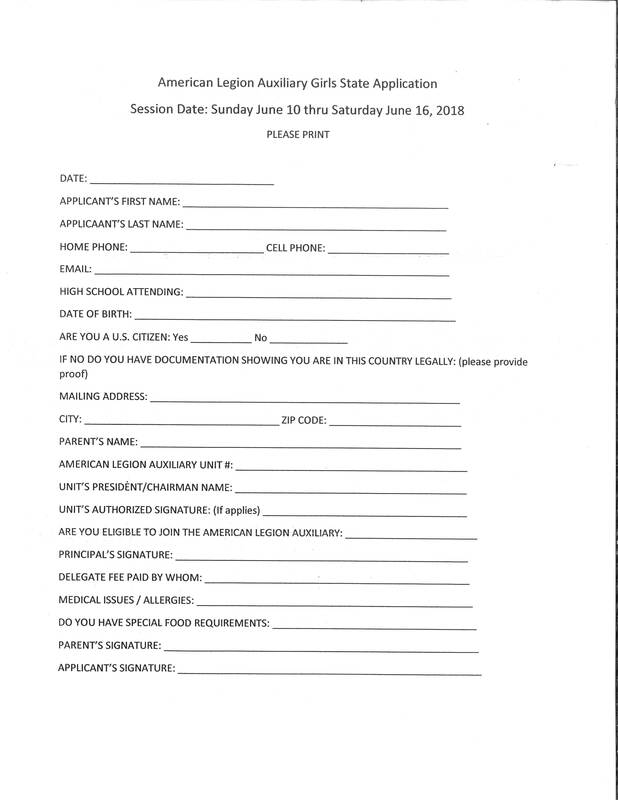 Current high school seniors, or the equivalent, who are citizens of the United States are eligible to apply. Applicants need not be related to a member of the Elks. High school graduates are not eligible to apply. Applicants must be citizens of the United States on the date their applications are signed; permanent legal resident status does not qualify. ​Click below for more information and to apply! The Presidential Leadership Scholarship (PLS) is the premier freshman scholarship for the Davidson Honors College. Montana resident students receive a full tuition waiver. All PLS recipients also receive a stipend of $7,500 for the Gold Level or $5,000 for the Silver Level. You can use it WITH the Montana University Scholarship as well! To apply, visit dhc.umt.edu and click on the red "Apply" button on the homepage! There is no cost to apply or to participate in the Davidson Honor College. Applications are due by December 1, 2018! 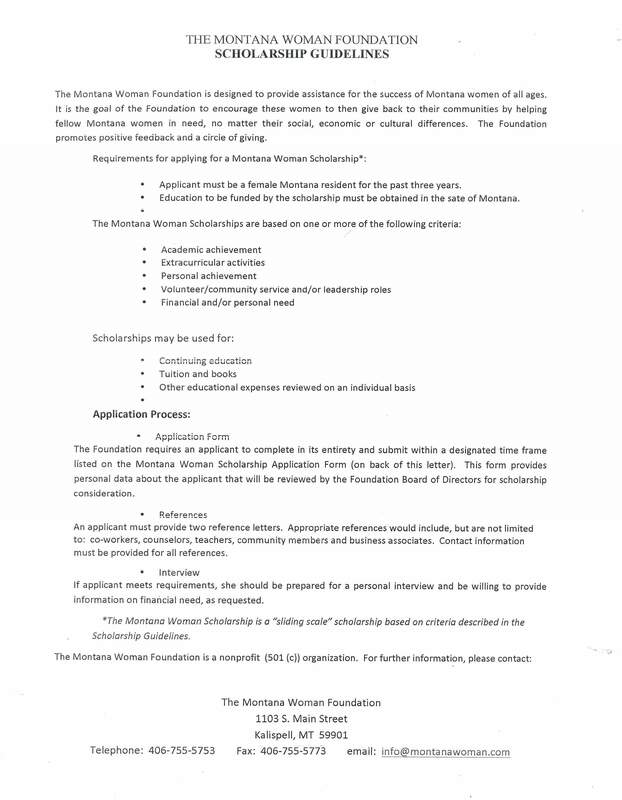 The Montana Woman Foundation (MWF) has scholarships available for women of all ages who want to begin their education or go back to college. MWF is a 501 (c)3, non-profit foundation. We strive to promote communities which recognize and support the beauty and power of women, their dreams and the significance of their contributions in our lives. Our mission is to provide assistance for the success of Montana Women of all ages. To encourage these women to then give back to their communities by helping fellow Montana women in need, no matter their social, economic or cultural differences. Applications are accepted from November 1 to February 1 of each year. Selections are announced in late April. ​Click here to download the Scholarship Guidelines. The Live Laugh Love like Lauryn Goldhahn Scholarship is open to all Montana high school students; regardless of post-secondary commitment or athletic accomplishment. ZipRecruiter is offering a $3,000 scholarship to the winning student with the best entry. Click here to apply: https://www.ziprecruiter.com/scholarship. Real Estate By Design is offering a $500 tuition scholarship for college students and Seniors in high school planning to attend college in the 2018-2019 school year anywhere in the United States. Students are encouraged to tell us about how you’ve helped in their local community through volunteering or making an impact on others. Our staff will choose our favorite essay submission and that student will receive a $500 scholarship. We're delighted to announce that we are offering a $2500 essay scholarship. We would love to make this scholarship opportunity available to your scholarship listing. It would be suitable for anyone enrolled as a full-time High school student or enrolled in any other accredited institute of higher learning. Must be 16 - 25 years old. Must be currently attending a High School, University or college during the 2018 calendar year. Provide your 250 word essay (How does Livability play a factor in selecting a college?) before 31st May 2018. A winner will be chosen by the 15th June 2018. Any graduating senior planning on attending Dawson Community College will want to apply their scholarships. The Foundation for Rural Service is awarding $125,000 in scholarships in celebration of their 25th Anniversary. Below, please find a link to the college scholarship application from the Foundation for Rural Service (FRS). Established in 1994, FRS, in cooperation with the National Telecommunications Cooperative Association (NTCA), seeks to sustain and enhance the quality of life throughout Rural America by advancing an understanding of rural telecommunications issues. In keeping with its mission, furthering the education of rural youth is one of the foundation’s primary focuses. Mid-Rivers Communications is a member of NTCA and we are proud to support FRS in this worthy endeavor. As your local telecommunications service provider, it is our pleasure to offer this national scholarship program to the students in your school. Should a student from our service area be selected to receive one of the $2,000 scholarships, Mid-Rivers will contribute an additional $500 to the scholarship, bringing the total one-time scholarship award to $2,500. Students may also be eligible for one of four JSI Staurulakis Family Scholarships valued at $5,000 each, the Everett Kneece Scholarship valued at $7,000 per student, the TMS Scholarship valued at $1,500 per student or one of three Roger Alan Cox Scholarship valued at $500 per student. Students who are majoring in math, science, engineering, or medicine are given preference for the JSI Staurulakis Family Scholarships. Eligibility for these scholarships requires that the student’s parent(s) or guardian(s) have one or more Mid-Rivers services. 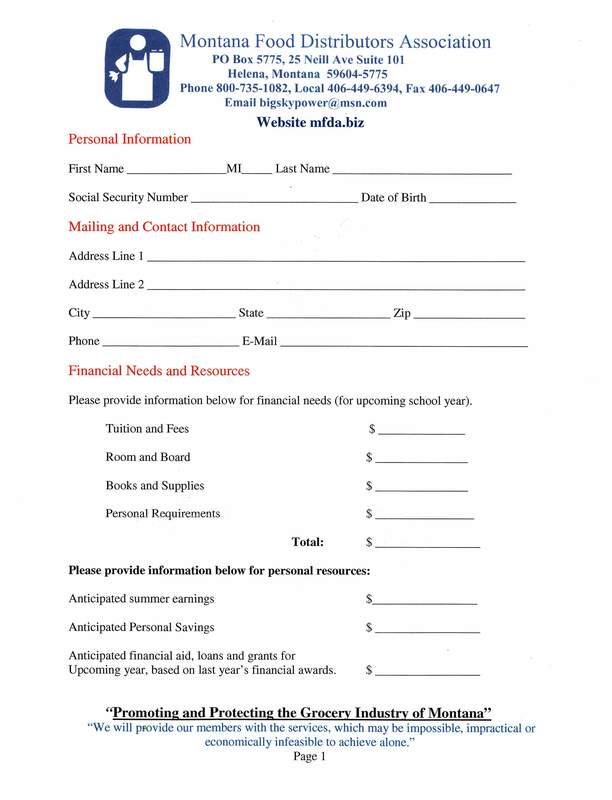 The application at the link below may be reproduced as needed or may be downloaded from the FRS website at http://www.frs.org. Every application must be signed by Mid-Rivers’ General Manger to be considered eligible. Applications must be postmarked to Mid-Rivers at 213 W. Benham St. Glendive. MT 59330 by February 18, 2019. Applications postmarked after this date will not be accepted. Mid-Rivers will forward all eligible applications to FRS prior to the FRS deadline on behalf of the applicants. We are very excited to bring this scholarship opportunity to our local school districts. Please help us make it a success by ensuring that all eligible students have an opportunity to apply. If you have any questions or concerns please feel free to contact me at (406) 687-3336. The Big Sky State Games has teamed up with the CHARACTER COUNTS! Coalition and Kenco Security and Technology to recognize the importance of sportsmanship and character in Montana student athletes. CHARACTER COUNTS! is a nonprofit organization striving to improve the character of today’s youth. It is based on common ethical values that transcend political, religious, socio-economic, and cultural differences. Called the “Six Pillars of Character,” these values are: trustworthiness, respect, responsibility, fairness, caring and citizenship. Character Counts! Scholarship is sponsored by Kenco Security and Technology. Over the past twelve years, the Big Sky State Games has awarded the Character Counts! Scholarship to outstanding Montana female and male student-citizen-athletes involved in the Big Sky State Games. The scholarship can be used for any secondary education after high school. This includes trade schools and community colleges. Only high school juniors during the 2018-2019 school year are eligible for this scholarship. This is to ensure that fellow students can observe the scholarship winners during their senior year and to recognize the traits the students show. Click here for more information or to download a scholarship application. The Generation Google Scholarship helps aspiring computer scientists excel in technology and become leaders in the field by providing a $10,000 scholarship for the 2018-2019 school year. Current high school seniors may apply to attend Google’s CSSI program in the summer 2018. Please visit Google’s website for more information and to apply! The Computer Science Summer Institute (CSSI) is a 3-week introduction to computer science for graduating high school seniors with a passion for technology. Google aims for students to leave empowered, heading to college armed with a unique learning experience. Please visit g.co/cssi for more information and to apply! Applications due March 2nd. MTSNA offers THREE $500 scholarships for anyone furthering their education in the field of nutrition. If you have a student or know of a former student that is going into the field of nutrition in any capacity, please encourage then to apply for this scholarship. The application must be completed by May 1; winners will be announced and awarded by May 15. B) Demonstrate an interest in Vegetarianism in the community or at school. B) Answer the Essay Question on the sponsors website. A) Be a high school junior or senior between the ages of 14 and 20. B) Create a design for a billboard advertisement to encourage safe driving. A) Be a high school senor planning on attending college next year. B) Be intending to pursue a college curriculum directed toward a career in applied geophysics. A) Be at least 16 years of age at the time of application and be a high school senior. B) Be of Asian or Pacific Island heritage. A) Be a high school student interested in learning and writing about issues of peace and conflict, encouraging appreciation for diplomacy's role in building partnerships that can advance peace building. B) Submit a portfolio of your journalistic skills. states or District of Columbia. Committee to review your academic record. paper. Do not submit any picture taken at an angle. ideas, innovation, and concepts previously unpublished. statement and then signing beneath it. Montana's 70th American Legion Auxiliary Girls State Session to be held Sunday June 10 thru Saturday June 16, 2018 at Carol College in Helena. The ALA Girls State is for young women who will be going into their senior year of high school who have an interest in learning about informed citizenship. To be eligible, girls must have completed their junior year in high school, have high moral character, show strong leadership abilities, demonstrate above-average scholastic achievement and have a keen interest in government and current events. The 2018 application is available at mtlegion.org. 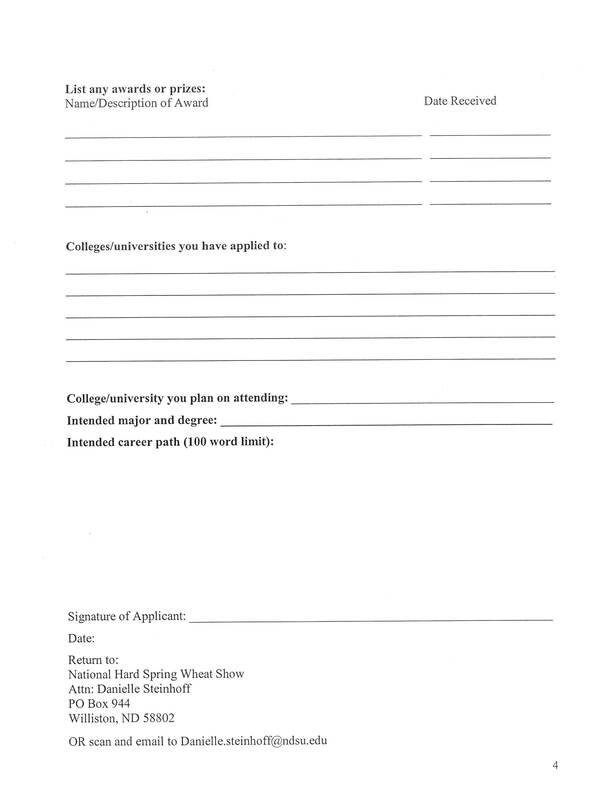 The applications near the bottom of the page and should be filled out on the computer (or written legibly), printed and handed in to Ms. Tuttle. Applications will be accepted January 1, 2018 until April 30, 2018. The Fall 2019 WCG Scholarship will cover tuition and fees for up to four consecutive semesters (excluding summer) for eligible William County and surrounding county high school graduates. Download the Fall 2018 Regional County Graduate Scholarship Terms & Conditions to the right for more details. Must be a graduate of an accredited high school or have received a GED in the Williams County area. The 2019 WCG Scholarship is available to all qualified graduates regardless of year. Scholarship recipients must maintain the listed requirements to maintain scholarship eligibility. Complete FAFSA Application (To apply, visit fafsa.gov and click Start a New FAFSA ) This scholarship will cover all remaining tuition and fees after federal Pell and state grants have been applied to a student's account. Scholarships are dependent on funding and are subject to change. To support this or any other scholarship please contact the WSCF at 701.572.9275. Are you or do you know a Montana high school senior who dreams of a career as a biologist, a chemist, or a mathematician? Someone interested in astrobiology, the chemical basis of life, or secret codes? The National Science Foundation and the University of Providence are partnering to provide 4-year S-STEM scholarships to a select group of biology, chemistry, and mathematics majors beginning Fall term 2018. In addition to scholarship support, these students will be invited to participate in undergraduate research projects, summer internships at national laboratories (e.g., NASA, DOE, NIH, NSA) and professional conferences. In these settings, students will apply concepts, skills, and dispositions learned at UP in new, challenging, and empowering settings. Like “beaming up to the Enterprise”, these experiences will build confidence and focus career aspirations. Great careers are founded on great dreams and great opportunities. 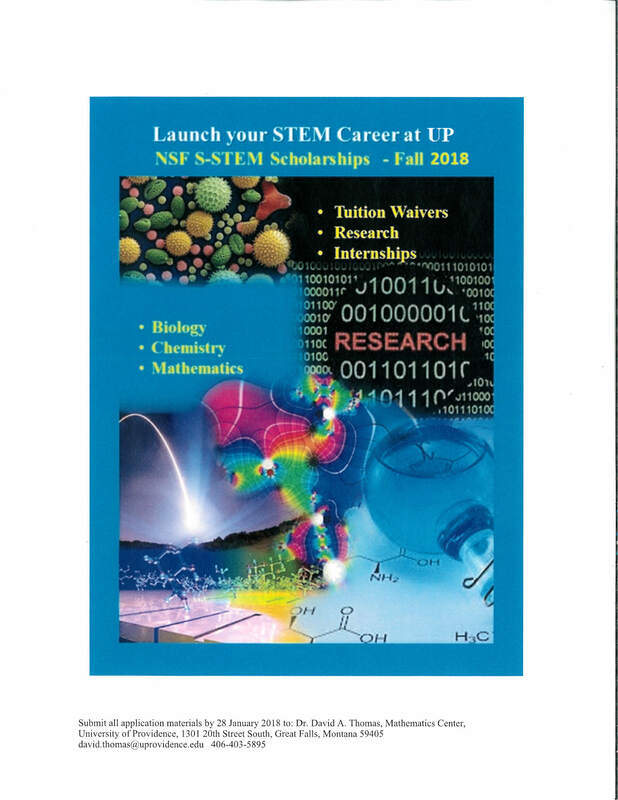 The S-STEM Program is just such an opportunity. Applications will be accepted until 28 January 2018. Step 3: Submit the S-STEM application. The Governor's Office of Community Service, Reach Higher Montana, and Montana Campus Compact are pleased to announce applications are now being accepted for the 2018 Youth Serve Montana Scholarship, the groups announced today. The Governor's Office of Community Service expands and promotes national service and volunteerism in Montana and engages citizens in service and emergency preparedness. Montana Campus Compact Montana Campus Compact is Montana's largest higher education network and works to improve community life by educating students for civic and social responsibility. Reach Higher Montana guides, prepares and supports Montana students in their efforts to reach their potential through higher education. Black Mountain Software is offering scholarships to Montana students. We are requesting your assistance to distribute our scholarship application. All interested 2018 graduating Montana high school seniors who will be attending an accredited institution of higher education, regardless of their field of study, are eligible. These accredited institutions include trades schools, technical schools, colleges or universities. Two Scholarships will be awarded in the amount of $500.00 each. Scholarship payment will be made directly to the school that the applicant will be attending. Applications and essays may be submitted electronically or mailed to Black Mountain Software. All submissions must be emailed or postmarked on or before April 15, 2018.
parents or guardians must be a member of LYREC and must be attending college in the fall of 2019.
student is chosen, LYREC will match the scholarship. emailed to jamip@lyrec.coop or sent to LYREC Attn: Jami Propp, PO Box 1047, Sidney, MT 59270. 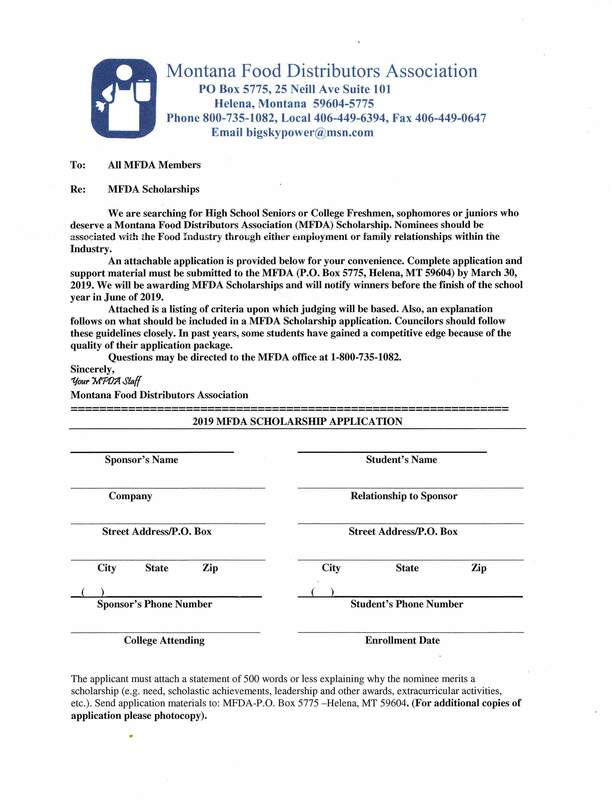 Click here for a MECA Scholarship Application. 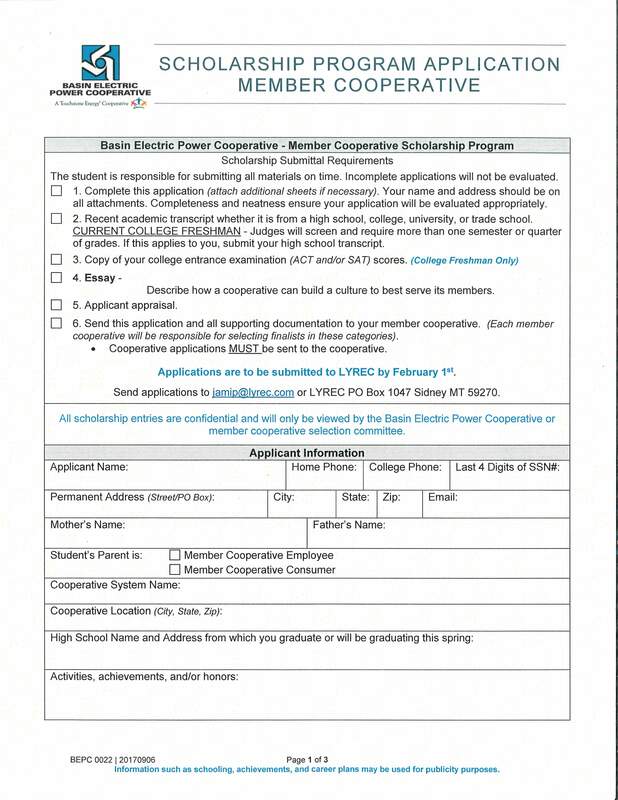 ​There is also a Basin Electric Power Cooperative Scholarship. 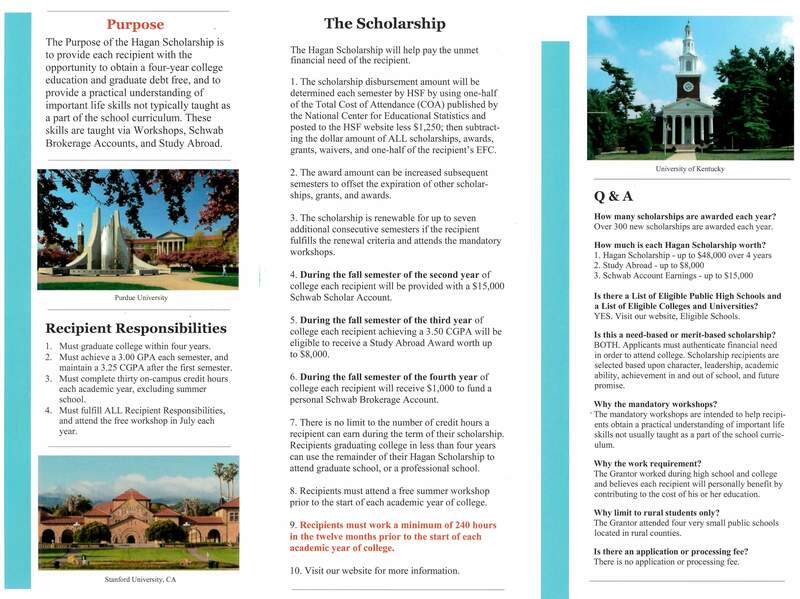 Click on the links below to download the three pages of the scholarship application. This scholarship is designed to support students from Williams, Divide, Burke, Mountrail, McKenzie, Sheridan, Roosevelt or Richland Counties to attend college for a degree in an agriculture related field. First prize will be $1,000, and two $500 runner up prizes will be awarded. 1) Be a graduating senior in high school, from the above counties, during the 2017-18 school year. 3) Be attending college for a degree in an agriculture related field in the fall of 2018. 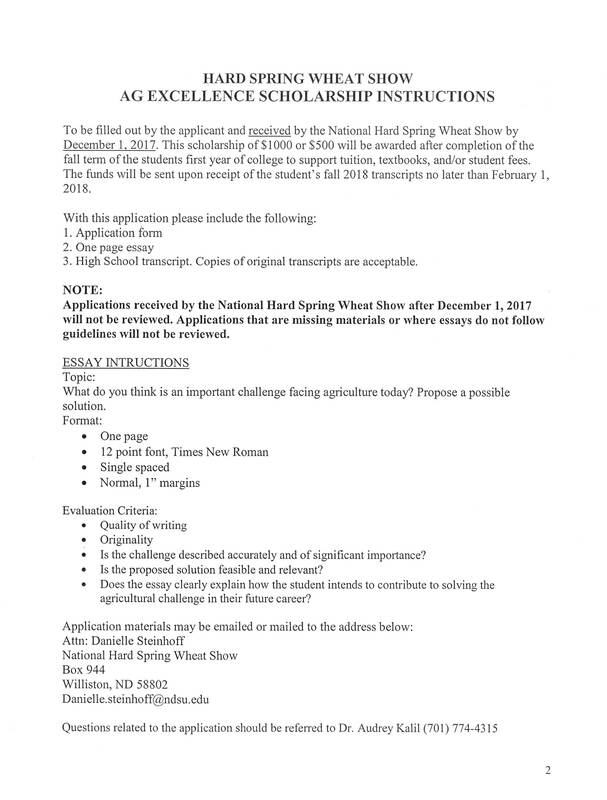 Application forms may be secured from the Williams County Extension office at 302, E. Broadway in Williston, you can email Danielle.steinhoff@ndsu.edu, or click below. Please read all the details in the Letter and follow the Scholarship Instructions as instructed. The Hard Spring Wheat Show board will make the final decision on the recipient of this scholarship. You will be notified prior to the 65th annual Hard Spring Wheat Show, February 6-8, 2018. If chosen, you will be required to attend the awards luncheon on Thursday, February 8th to receive recognition. Applications received AFTER December 1 will not be accepted. Whether through essays or multimedia, students have used their voices to share visions for a better world. We're asking high school seniors to submit a proposal for how they'll better their communities. Because this will be a much more rigorous process with multiple rounds, we're also raising the bar for tuition awards: from five $1,000 tuition awards to five $10,000 tuition awards! We will also fund the top project up to $5,000. We select applications based on their completion, seriousness, and viability, offering feedback for those approved to move on to round 2. LAUNCH phase of design thinking launch cycle. Students submit a final reflection that shares how their project is doing one of the following: 1) increasing connections, 2) building capacity, or 3) taking community-led action. They also share their ideas for acquiring further funding, in addition to the $5,000 from HGU if selected as the top finalist. Deadline: April 15, 2018 at 11:59 MST. 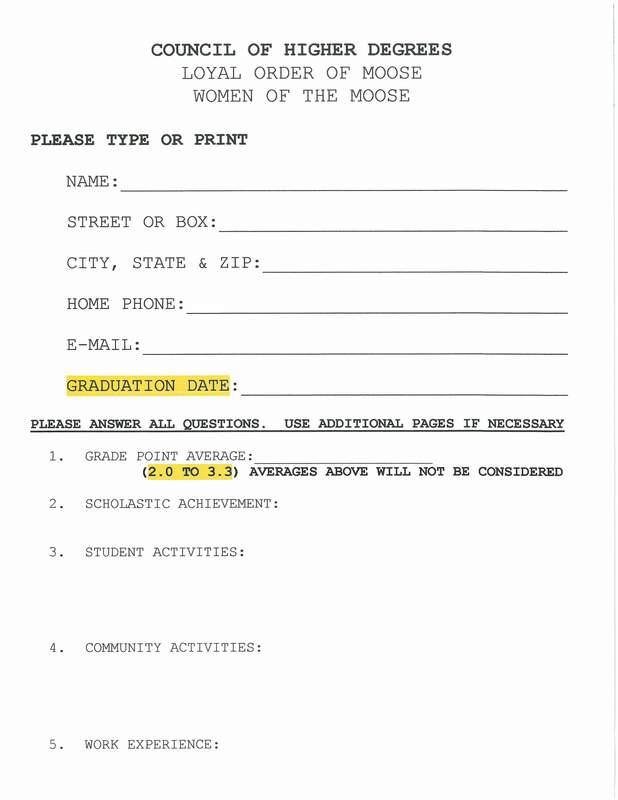 Here is a link to anything else you may need to know about our scholarship, including a digital form to submit their projects: https://www.honorsgraduation.com/graduation-scholarship.htm. 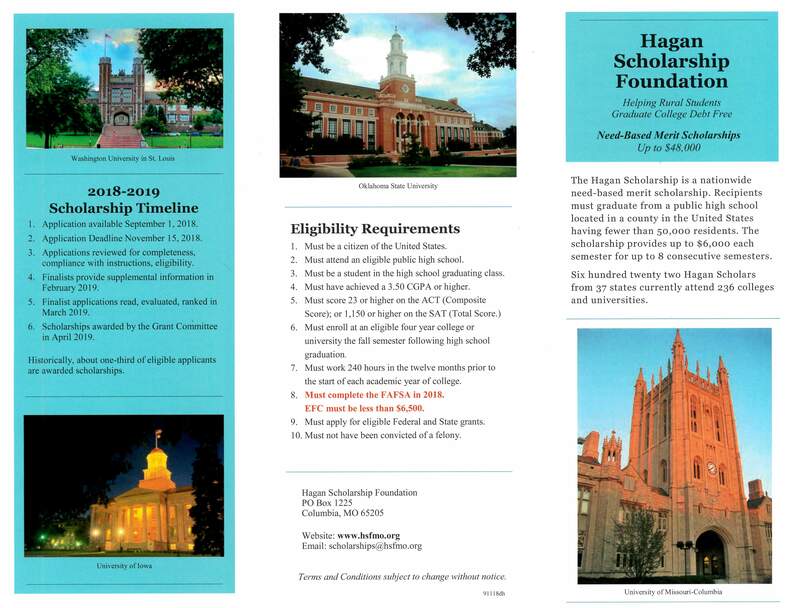 The Hagan Scholarship is a nationwide need-based merit scholarship for high achieving, self-motivated students. The scholarship provides up to $6,000 each semester, up to $48,000 over four years. Hagan Scholars from thirty seven states currently attend two hundred thirty six colleges and universities. Recipients must graduate from a public high school located in a county having fewer than 50,000 residents and enroll at a four-year college or university the first semester following high school graduation. Free Workshops, Schwab Accounts, and Study Abroad provide recipients with a practical understanding of important life skills not typically taught as a part of the school curriculum. For more information, including the scholarship application, please visit our website at www.hsfmo.org. The application deadline is November 15, 2017. Or, take a look at the brochure links to the right. The Elks National Foundation Awards $2.44 million in college scholarships to a total of 500 high school seniors nationwide through its Most Valuable Student contest. High school seniors that are U.S. citizens may apply. 500 Four-Year Scholarships will be awarded. Any student that did not receive one of the competitive scholarships that Mid-Rivers awarded will be eligible for the ten $500 scholarships that will be drawn at the Cooperative's Annual Meeting on June 1, 2017 at the EPEC in Glendive, MT. - attend the Annual Meeting with a parent of guardian who is a Cooperative Member with active local telephone or Internet service from Mid-Rivers. - and be present during the Business Metting when the drawing takes place. High school seniors and current college students returning to school in the fall are eligible; previous Mid-Rivers Scholarship winners are not eligible. Dinner will be served to all attending at 11:00 a.m., with the Business Meeting beginning at 1:00 p.m. Students with questions about the scholarship drawing may contact me 1-800-452-2288. 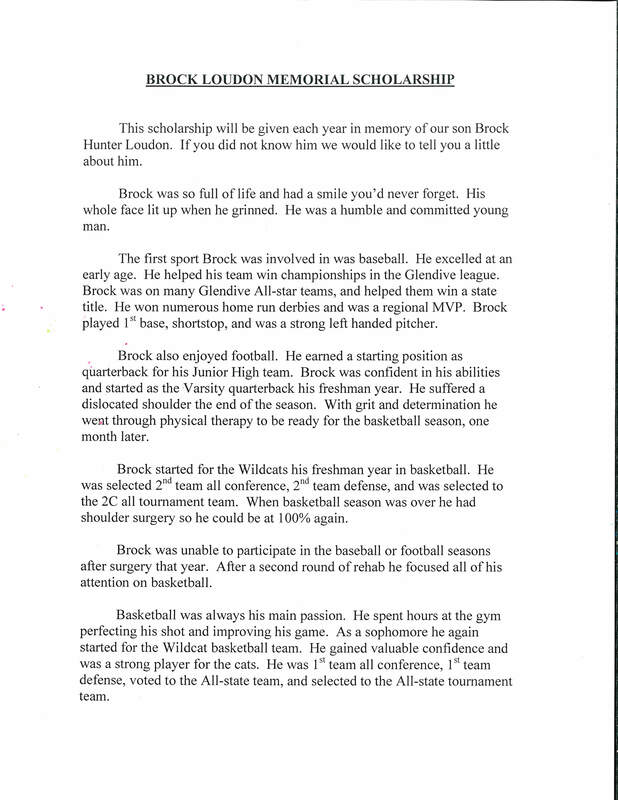 This scholarship is given in memory of Brock Hunter Loudon who played many sports for the Circle Wildcats and hoped to play basketball in college and earn a degree in physical therapy. 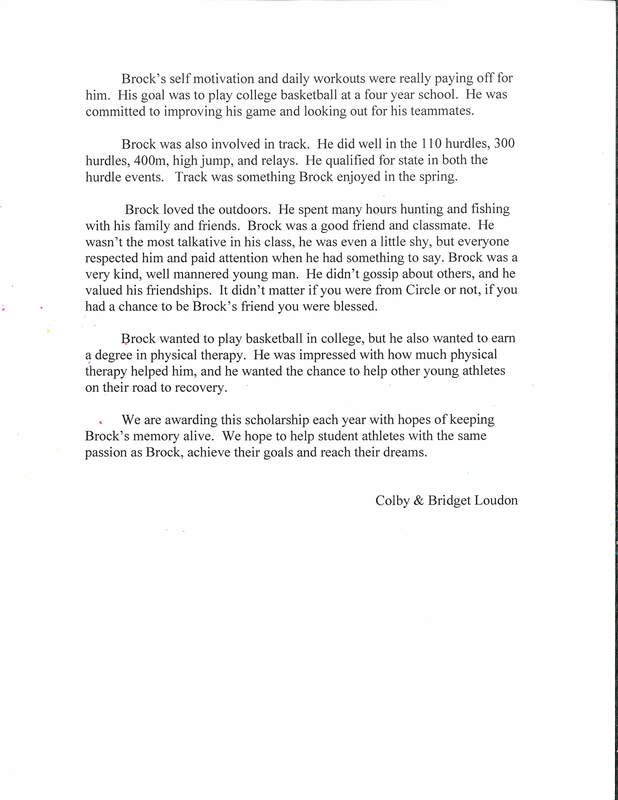 To learn more about Brock and his life, click on the links below. For a Scholarship application click on the link below. There will be two scholarships of $500.00 a year to a high school athlete. Study.com is excited to share a new scholarship we are offering to current and soon-to-be college students. At Study.com, our mission is to make education accessible. Our College Success Scholarship gives one lucky student $1,000 to help with their tuition. We would love for your students to take advantage of this scholarship! Applying for the College Success Scholarship Students need to apply by April 1, 2017, which gives them plenty of time to submit the quick and easy application! We will choose one winner based on their free response submissions. As part of Black Note’s goal of giving back to the community, we award scholarships of $2,000 per student on an ongoing basis. To be considered, students must meet our eligibility requirements, complete an online application and submit an essay that impresses us. You can find more information on our on $2,000 Get a Boost Scholarship page. 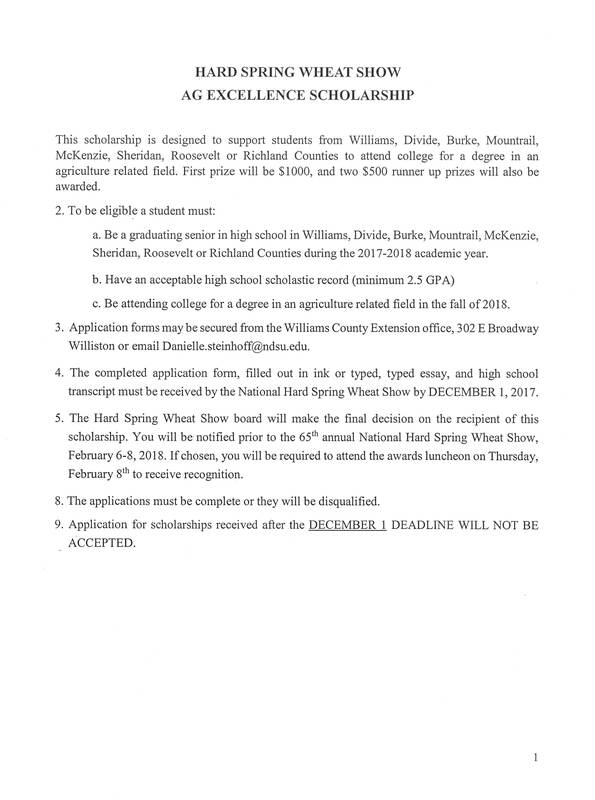 The Richland County Farm Bureau Federation is offering 2 scholarships to graduating high school seniors within Richland County. Applications can be found at https://mfbf.org/foundation/scholarships and all applications must be postmarked by Monday, April 1, 2019. Applications must be on the correct application and contain the student's transcript and 2 letters of recommendation. The Diagnosis Delayed scholarship is open to all students pursuing a medical or legal degree. Students must be enrolled in a program at the date of application. ~Proof of Enrollment: acceptance letter, current class schedule, etc. The Montana Sheriff's and Peace Officer Association announces the availability of two $750.00 scholarships to be awarded for the fall semester of 2019 to a graduating high school senior who is seeking a career in local law enforcement. Recipients will be selected on the basis on need and academic ability as well as career goals. 1) High school graduate or successful GED completion. 2) Must be able to meet basic peace officer eligibility requirement as established by Montana statute and the Montana Peace Officers Standards and Training Council. 3) Must have a high school grade point average of at least 2.5 and preferably plant so be enrolled as a full-time student in a Montana based college or university that offer a minimum AA degree in the Criminal Justice Field. 4) High School students applying for the fall scholarship must submit proof on enrollment intention in a university or college. 6) Statement of how you are currently financing your college education. 7) Letter from high school or college adviser verifying your academic abilities and attesting to the fact you are enrolled in or have applied for a criminal just degree program. The scholarship award winner(s) check for $750.00 will be issued, in the applicant's name, and forwarded to the college/university in which he/she is enrolled. The Sidney Job Service Employers Committee(JSEC) is offering scholarships of $500 to graduating seniors-- Class of 2019 -- who intend to further their education/training fall semester following graduation at a tech school. 1. Will be awarded at $500 prior to the start of fall semester. 2. Can be used only for the 2019 – 2020 school year. 3. Will be paid by the Job Service Employers Committee directly to the school of your enrollment. 4. Failure to attend fall semester forfeits the award. 1. 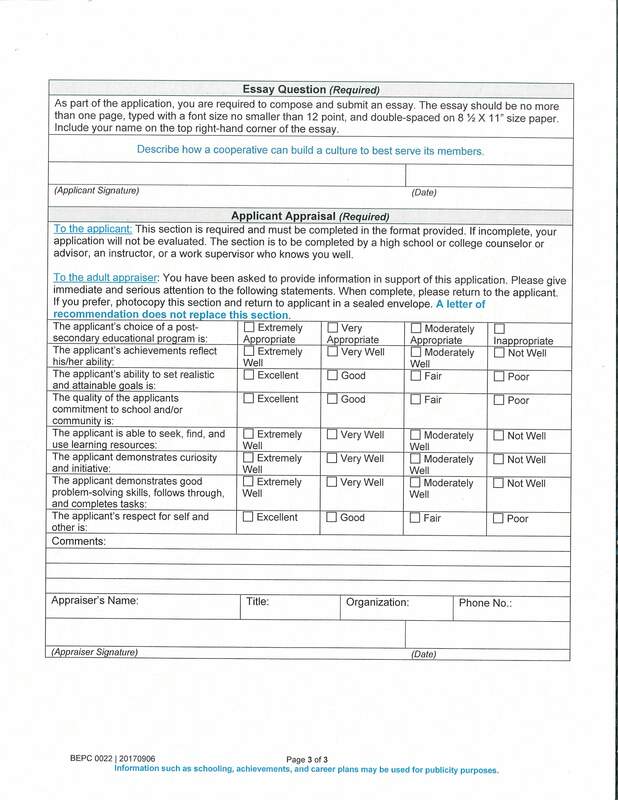 Fill out the attached application form. 2. Answer the essay questions indicated on the form. 3. Attach a copy of your high school transcript. 4. Obtain reference letters from one non-relatives and one from a teacher or industry mentor. RETURN YOUR COMPLETED PACKAGE BY March 1, 2019. The Montana Food Distributors Association (MFDA) awards scholarships annually provided by the MFDA. Click here for the full Judging Criteria. The Montana PTA Scholarship Program offers financial assistance to student entering a Montana college or university with plans to become an educator. This year we are awarding a $500.00 scholarship to a graduating high school senior in Montana. Submission information and application forms are available on the Montanat PTA website, www.montanapta.org. Click on "Scholarship". Applications for our $1,000.00 Annual Scholarship for Montana Seniors are now being accepted. Click on Scholarship & Senatorship Forms then select the MT JC Scholarship Application Form. If you have any questions, please contact Janet Prescott at 406-580-6812. 1) A parent or guardian must be a member of Lower Yellowstone Rural Electric Cooperative. 2) Applicant must be enrolled or planning to enroll in a full-time graduate or undergraduate course of study at an accredited, two-year or four-year college, university or vocational/technical school. 3) To get an application, click below, or for more information, go to our website at: www.lyrec.com and click on Community & Scholarship. Click here for a scholarship application! Black Mountain Software will be awarding two $1,000.00 scholarships to graduating seniors in Montana. Any Montana high school senior graduating in 2019 may apply if he or she will be attending an accredited institution of higher education. These accredited institutions include trade schools, technical schools, colleges or universities. The applicant’s field of study may be any field that they want to pursue. Students must pursue a bachelor's degree at the University of Montana or Montana State University school systems to apply. This scholarship is for anyone interested in nursing, studying, living, and working in Montana. The recipient must have graduated from a North Dakota or Montana high school. All awards are contingent upon the student being accepted by and registered at an accredited school. Interested candidates must submit three reference letters: They could be from a principal, counselor, teacher, or adviser, employer, or someone in the community. 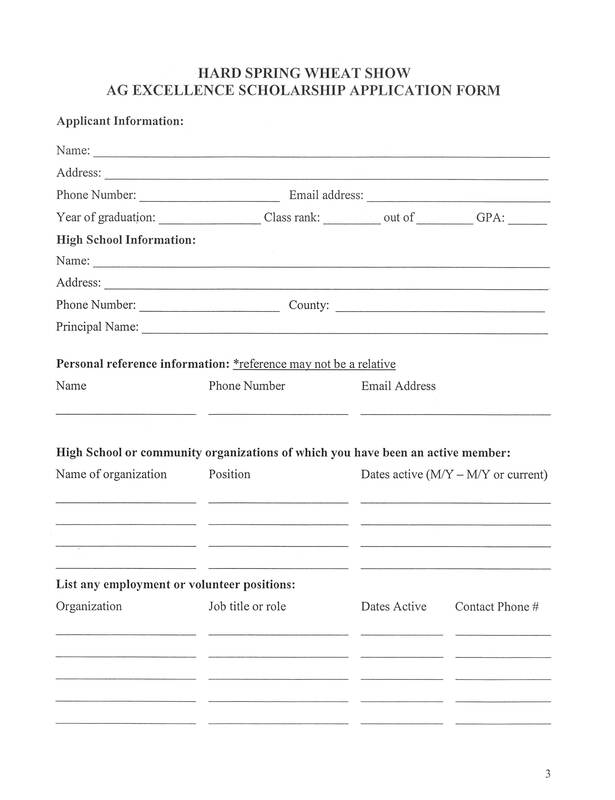 The Scholarship form must be complete to be considered for scholarships. An official copy of your high school or college transcript must be included. Scholarships to be awarded in 2018 must be submitted on or before February 15, 2018. Mid-Rivers will award 35 $1,000 Higher Education Scholarships in 2017 to students whose parent/guardian is a cooperative member with active local telephone or Internet service. Students must be graduating high school seniors entering their freshman year of college, university, or technical school in the fall of 2017. Current college, university, or technical students planning on continuing their education in the fall of 2017 may also apply. Ten additional $500 scholarships will be awarded at the Mid-Rivers Annual Meeting on June 1, 2017 in Glendive. To qualify for the drawing, students must provide documentation of full-time enrollment at the Annual Meeting and be accompanied by a parent/guardian who is a Cooperative Member. Any students who receives a $1,000 competitive scholarship or any previous scholarships are NOT eligible for the drawing. The Health Care Scholarship offers financial assistance to students who plan to attend an accredited technical school, college or university in Montana or Wyoming and who desire to work in a health care career. 1) A parent, grandparent or guardian must be an active Mon-Dak API Member. 2) The previous semester GPA must be a 2.8 or higher with verification from the educational institution. Documentation must be provided by the student. 3) Applicant must be enrolled as a full time student at a state accredited institution of higher learning or a state accredited vocational school. 4) A student meeting all the criteria may re-apply each year. MonDak Stockgrowers Association will award four scholarships towards students who want to further their education in an agriculture related field. Funds will be raised through the Rockin’ Your Heart Cattlemen’s Ball event held annually. The four scholarships to be given will be in the amounts of $1,000 and $500. One - $1,000 and one - $500 scholarship will be given to a graduating high school senior; and one - $1,000 and one - $500 scholarship will be given to a current college student or a student looking to return to college. Funds will be sent directly to the college. Applicant must be a resident of Dawson, Richland, Roosevelt or Wibaux County, MT; Golden Valley, McKenzie or Williams County, ND. Applicant must be a citizen of United States of America. 1) The student must attend a college, university, vo-tech, business, nursing, beauty school or etc. in Montana. 2) Only students with a 3.0 or lower GPA will be considered. a) A transcript to show your Cumulative GPA. you plan to attend and your major. as the $500.00 will be paid to the Institution you attend. you family is or was an Odd Fellow or a Rebekah. d) Why you are applying? State your financial need. e) A photo of yourself. ​ friend or relative, (1) an employer or church pastor. g) A stamped self-addressed envelope. 6) List of school extracurricular activities including offices held if any. 7) List of school activities including employment and volunteer experience. 8) State your plans for the future, the name of the institution you will be attending and career or profession you are pursuing and why. 9) Briefly tell why you should be selected as the recipient of this scholasrhip. 10) Three letters of references. 11) List any parents, grandparents, aunts, uncles, or any other family members who are Moose members. E) Moose affiliated candidates will have first consideration. The application will not be discriminated against because of race, religion, age, mental or physical handicap, national origin, marital or parental status, or political belief. Payment of the scholarship will be made directly to the College Financial Aid Office in two payments. The first payment of $250.00 will be made when information by recipient is given to the Women of the Moose. The second payment of $250.00 will be made when first semester or quarter grades are received by the Women of the Moose. A 2.5 GPA is required. 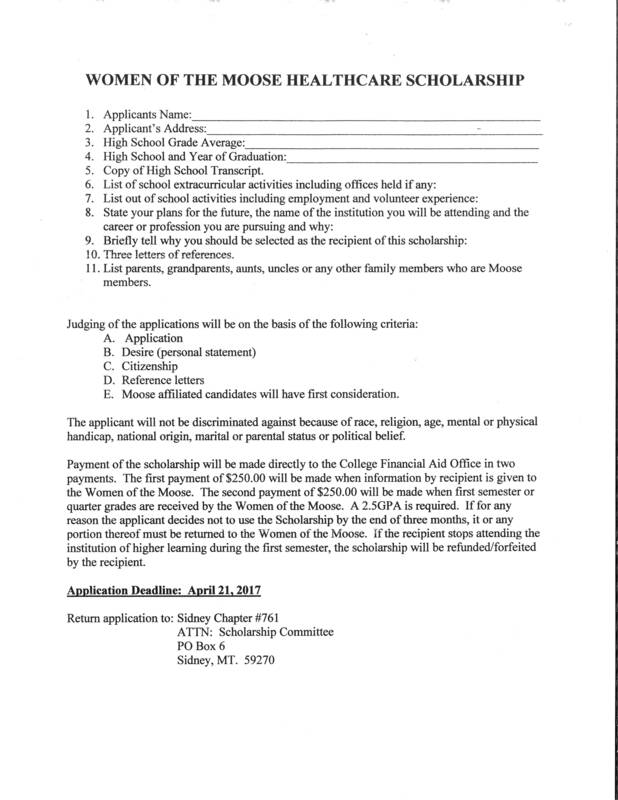 If for any reason the applicant decides not to use the Scholarship by the end of three months, it or any portion thereof must be returning to the Women of the Moose. If the recipient stops attending the institution of higher learning during the first semester the scholarship will be refunded/forfeited by the recipient. This scholarship is presented by Lower Yellowstone Lodge #90 of Masons and is in the amount of $500 or more annually. It is presented to a deserving senior or continuing education student of Richland County. The Hawley Memorial Scholarship was created in 1987 by Richland Chapter #62 of Eastern Star in loving memory of Earl & Clona Hawley to recognize the devotion of Mr. & Mrs. Hawley to their community. This scholarship is open to all graduating seniors in Richland County as well as continuing education college students from Richland County with a 3.00 GPA or better. 1) Please present the scholarship application and letters of recommendation in a portfolio. 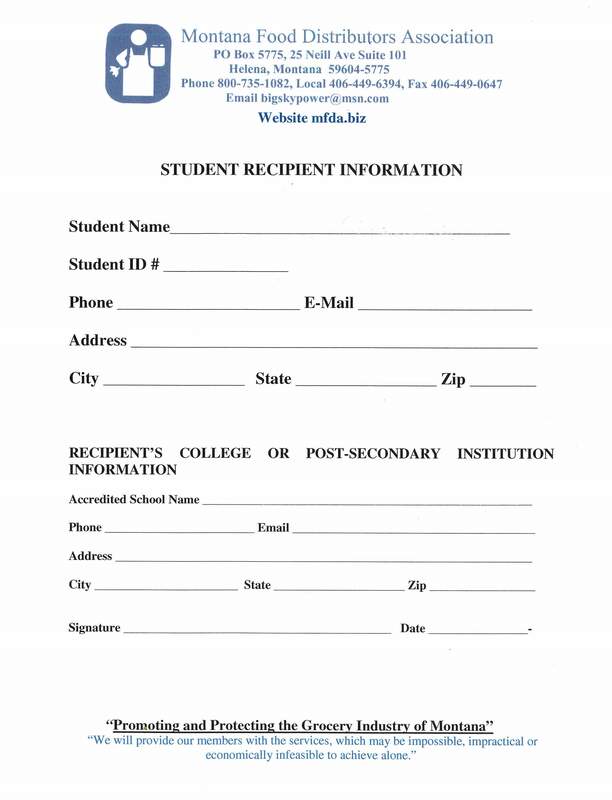 2) Please include in the scholarship application the full name of the applicant and mailing address. 3) Extra- curricular activities including any offices held, honor or awards. ​4) List any out-of-school activities, including employment. 5) Explain your detailed plans for the future in a personal statement and the reasons you feel qualified for this scholarship. ~A statement from two (2) faculty members of your high school or your college or university department. ~At least one (1) and not more than two (2) letters of recommendation from persons not related to the applicant. ~An official transcript of grades and your ACT and/or SAT scores. ~The institution of higher learning you plan to attend or are attending at the present time. 7) Scholarship Awards will be sent to you after proof of enrollment is received from the College or University Registrar’s office or with an official schedule of classes from the College or University you will be attending. The name of the annual scholarship to be awarded shall be the “Ben York Masonic Scholarship”. The number of scholarships and the amount of each to be awarded annually as the Ben York Masonic Scholarship shall be determined by committee of Lower Yellowstone Lodge #90, Sidney, Montana. The minimum amount designated for each scholarship shall be Five Hundred Dollars ($500.00). 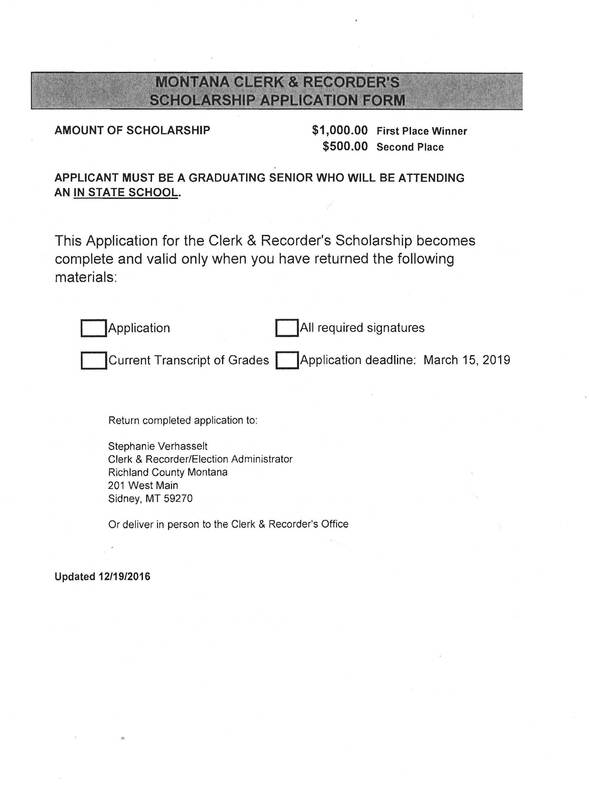 An applicant shall be deemed qualified to apply for the award even if not a legal resident of Richland County, Montana, if the applicant attended a Richland County high school for his or her senior year, and graduated from the Richland County high school. It is a requirement of this scholarship that the applicant choose a field of study restricted to the “Construction/Building Trades” i.e. plumbing, electrical, heating and/or air conditioning, etc. It is anticipated that the applicant will attend a Trade School or a Technical School. Either full-time or part-time attendance is acceptable. The Masonic Scholarship Selection Committee shall, each year on or prior to April 1st, select the scholarship recipient based upon the applications submitted, and make suitable arrangements for the award and presentation of the scholarship. The application of each winner shall be maintained in a permanent file by the committee. The scholarship award shall be paid by the Lower Yellowstone Lodge #90 (Masonic Lodge) to the winner at such times following the award, as proof of enrollment has been furnished and in such amounts as the Masonic Lodge, in their discretion, deem proper under the individual circumstances to defray the costs of further education for the winner. The Council of Higher Degrees of the Loyal Order of Moose and the Women of the Moose are now making available a scholarship in the amount of $1,000.00. 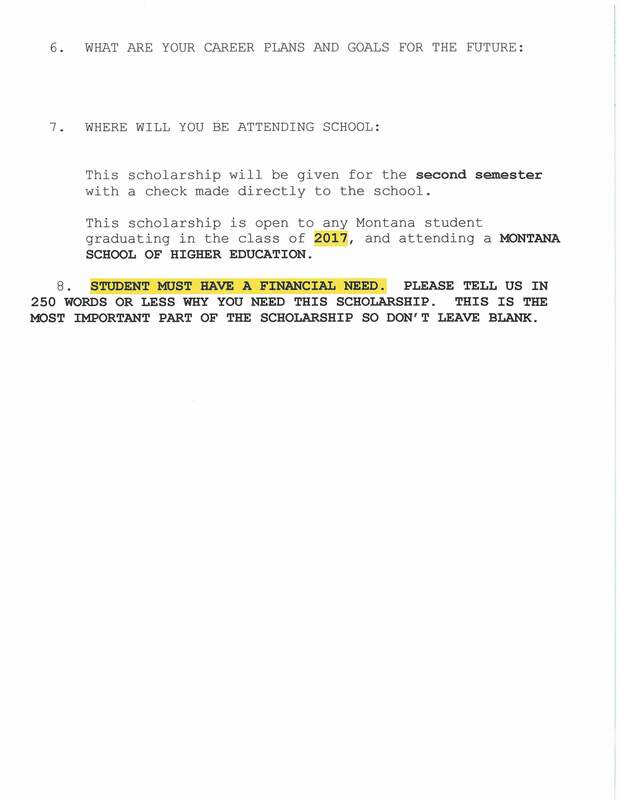 It is our wish that this scholarship goes to a student who is attending a Montana High School. The student applying NEEDS NOT to be affiliated to a Moose member, but must SHOW FINANCIAL NEED. Scholarship winners will be announced ar our Montana Moose Association Convention in October, and winners will be notified immediatly therafter. Please remember you must be going into a MONTANA SCHOOL OF HIGHER EDUCATION. This scholarship is for a graduating senior of 2017. Students may apply ONLINE from March 4- May 13, 2016. This scholarship will be awarded to 20 Montana high school seniors going on to a college, university, or vocational and technical schools to study in STEM-related programs, with preference given to computer sciences, engineering and bio-health sciences. Student can access information and the online application for this scholarship and others at www.mtcf.org/applications. 1) This scholarship must be used at a post-secondary institute. 2)The student must be a candidate for graduating from a Northeast Montana High School where the Athletic Directer is a member in good standing in the MIAAA. 3) The scholarship will be awarded at the beginning of the second semester of the students freshman year. Click here for an official application! 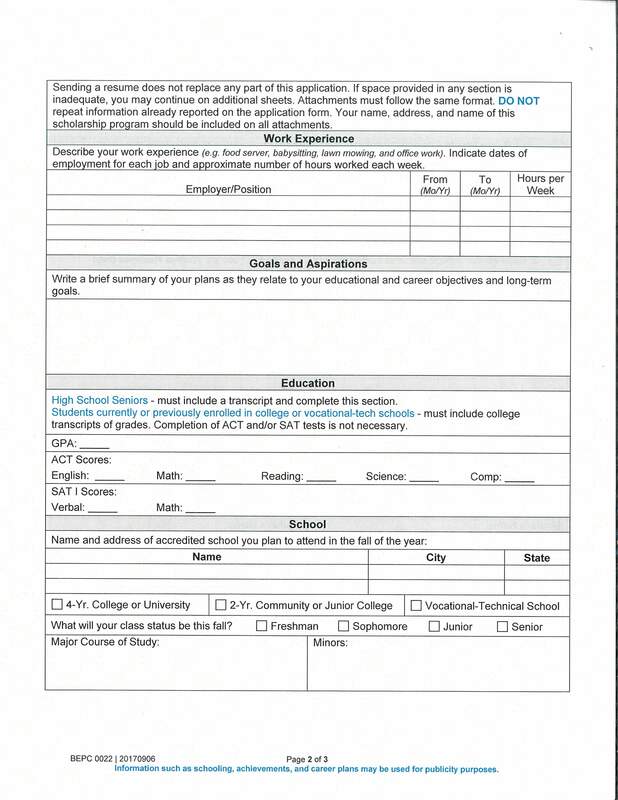 Return application to your athletic director. Only one application per school will be submitted to the NEMIAAA selection committee. Richland County Farm Bureau is giving away a $1,000 scholarship to a graduating senior, whose parents are Farm Bureau members. I have included the link to the application, and the rest of the information can be found in there. It needs to be mailed back to the County Farm Bureau no later than April 1st. It can be mailed back to PO Box 1267, Sidney, MT 59270. The number of scholarships and the amount of each to be awarded annually as the Henry Elm Scholarship shall be determined by Order of Court approving the annual account of trustees under the will of Henry Elm, Deceased, for the preceding calendar year. Click here for an application and more information about the scholarship. Reminder that the deadline for the applications is April 14, 2017. If you are mailing your applications, please have them mailed to: 301 West Holly, Sidney, MT 59270 – Attention: Dianne Etzel. (This is a different address from the address on the application.) Any applications received by mail must be postmarked by April 14, 2017. Any applications with a later date will not be accepted. The scholarship application is due to Ms. Tuttle by April 25th! Click here to download the Fall 2019 Regional County Graduate Scholarship Terms & Conditions. Don't forget to contact the college(s) of your choice for specific scholarships as they usually do not send specific information to school counselors. Check out school web sites and other scholarship sites for additional financial opportunities. You can even buy a scholarship book or check out one from a library. There’s a lot of money out there to finance your education if you take the time to look and apply!